2018 Hogan Cup Team in their finest! Washington Junior Golf Association welcomes junior golfers who live in Northern Idaho and in Umatilla County, Oregon. These players are a key part of WJGA, and some may wish to represent Washington on our teams. Those teams are the Boys and Girls Junior Americas Cup, the Hogan Cup and the North Pacific Junior Ladies Team Matches. Any player who is a resident of Idaho or Oregon, and will be attempting to make any of those teams, must declare at the BEGINNING OF THE SEASON if they wish to represent their state of residence or Washington. That declaration may be made to the District Tournament Director or directly to the WJGA office at tyler.johnsen@wjga.net. Boys and girls playing in the 14-15 or 16-18 divisions will be eligible to earn points. To be eligible for teams or for the Player of the Year Award, the player must play in at least one WJGA sub-district event in 2019. Only the USGA Junior Boys’ and Girls’ Qualifiers held in the WJGA territory. In the event that a USGA Boys or Girls qualifier is held AFTER the WJGA Junior World Qualifier, points earned at the USGA qualifiers will not be used for Junior America’s Cup team selection for that year. Best two of three finishes at the Western Open, the Eastern Open and The Players Open. Contestants may play in all three events, but for points and team selection purposes, only the best finishes of two of the three events will be used. 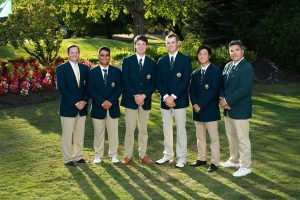 (4 players) This team will be chosen immediately following the conclusion of the WJGA State Championship, and based on the top four boys on the overall statewide points list. Boys playing on the JAC team will not be eligible to play in the Hogan Cup. (6 players) This team will be selected on total points earned for the entire 2018 season. In 2019 this event will be hosted by British Columbia at Quilchena G&CC,. In order to be eligible for selection, players must be a confirmed member of WJGA for the 2019 season and signed up to play in at least one WJGA sub district event. Player of the Year Awards (boys and girls) will be selected on play over the entire season, including points earned at the Boys and Girls Junior America’s Cup events.